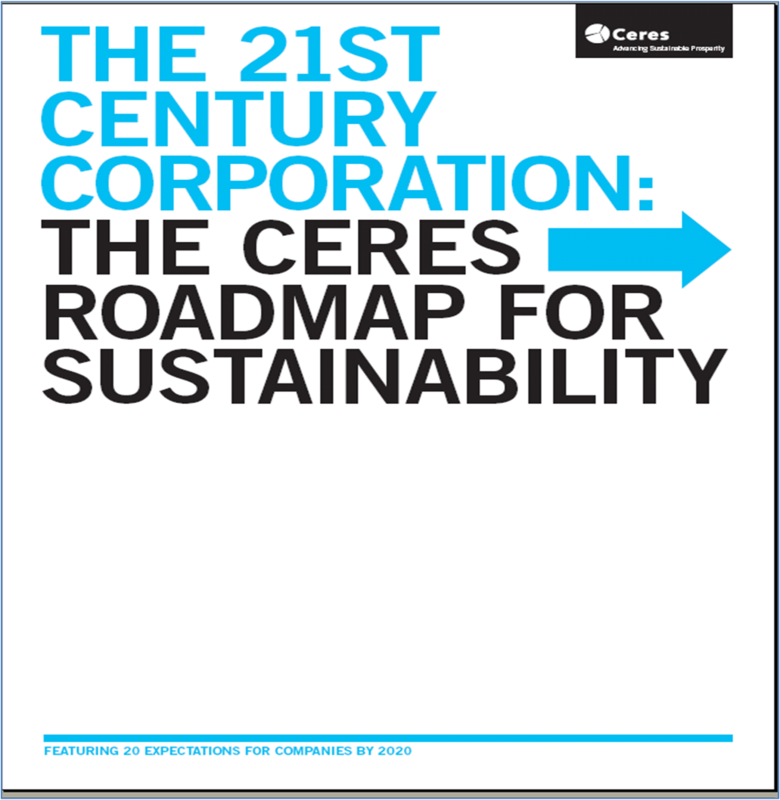 Ceres’ report, titled “21st Century Corporation: The Ceres Roadmap to Sustainability” which it released earlier this spring, contains noteworthy proposals for corporate governance and green marketing. As a network of investors, environmental organizations and public interest groups, Ceres incorporates the private sector perspective into the sustainability movement. The report encourages organizations to create serious internal metrics for sustainability rather than limiting their focus to their sales and PR efforts. Out of the 20 expectations presented for new business standards, I wanted to highlight three in particular, which, if implemented, would help align business objectives with sustainability goals in a meaningful way. The first expectation of note is “requiring clear public policy position statements” from companies. Ceres believes that companies should disclose their public policy positions, as well as membership in and contributions to trade associations. When appropriate, companies should also develop public policy positions that support best practices in sustainability. An example of this was in Fall 2009, when several companies, including Apple, left the U.S. Chamber of Commerce because of the organization’s criticism of pending climate change legislation. This expectation would go a long way in removing the current disconnect between lobbying and marketing by requiring companies to integrate sustainability messages into consumer communication, and actually prove that they’re truly committed to environmentally-sound practices. Another standard worth mentioning is for companies to require “suppliers to meet the same sustainable standards as the company.” As part of a marketing communications company with some of the strongest environmental standards in the industry, I understand the environmental impact that sustainable practices, and, alternatively, their absence can have across the entire supply chain. This recommendation would reward suppliers with positive environmental practices, incentivize companies to work with environmentally-minded suppliers, and hold companies accountable not just for their own practices but for their vendors’ practices. A final impressive expectation laid out in the report is “designing and delivering products [and services] aligned with sustainability goals.” This expectation goes to the heart of a company’s work and places a high consideration on sustainability in product formulation and promotion. By factoring environmental considerations into the creation of products, companies will be playing a positive role in shaping consumer behavior by moving consumption patterns toward sustainable ends. As someone passionate about green pursuits, I see this expectation as the one with the most potential beneficial impact in the sustainability cause. Ceres mentions one interesting way to implement this final idea: it recommends that companies “re-conceive the idea of a ‘product’ such as transitioning from offering products to offering utilities or services. “ In fact, Ceres mentions one of Grossman Marketing Group’s most sustainable-minded clients, Zipcar, which has reshaped the way consumers use automobiles. As mentioned, Zipcar offers customers the use of a car in hourly units, which removes the need to own a car for urban use and moves toward offering the car as a service. Zipcar also offers lower pricing for hybrid vehicles, encouraging customers to use this cleaner mode of transport. While this report contains some impressive ideas for corporate reform, it is unclear whether and to what extent such expectations will be implemented in the coming years. Regardless, the report serves as a positive sign that some agreement has been reached between private sector influencers and public sector opinion leaders on the need to move forward in implementing sustainability standards. It also lays out for companies a sustainability roadmap, should they choose to use it. Click here to access the full Ceres report. 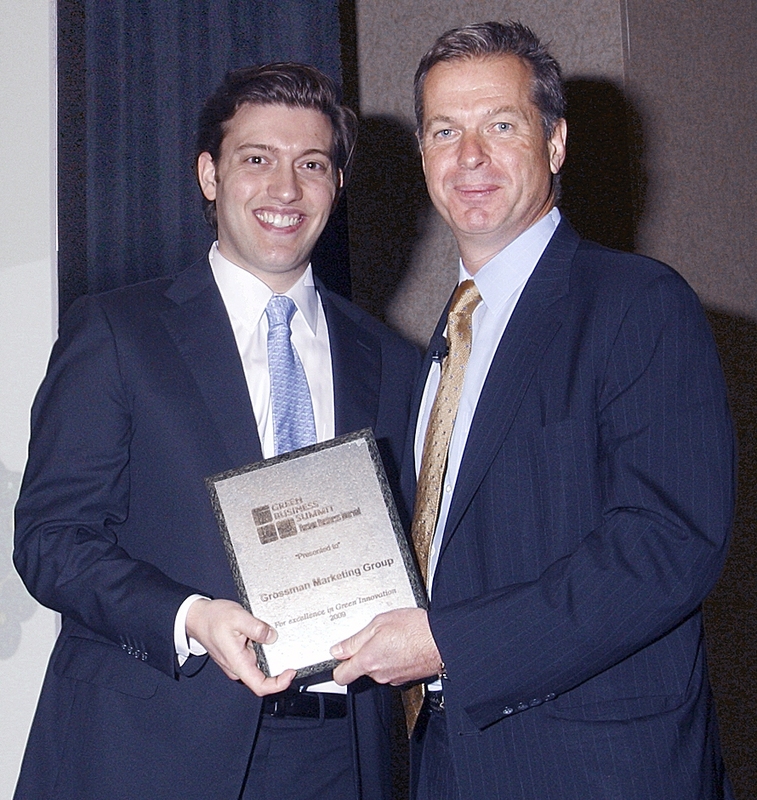 I was honored and humbled to receive the 2009 New England Direct Marketing Association Prodigy Award, for my work in the green marketing and sustainability space. I received the award at the NEDMA 2009 Annual Conference held earlier this month at Bentley College in Waltham, Massachusetts. According to NEDMA, the Prodigy Award is given each year to one marketing professional in New England under the age of 30 who has added the most to the art and science of direct marketing in the prior year. NEDMA started the award eight years ago to recognize some of the most talented young marketers in the region. During that time, members of organizations like Hill Holliday, Mullen, Oceanos and Vistaprint have been recognized for their expertise in areas including graphic design, direct mail and interactive media. Many thanks to NEDMA for including me in this process and for all the work the organization does to help develop the next generation of marketing professionals in New England. As I wrote last month, my firm was honored to receive a green business award at the Boston Business Journal Green Business Summit. We were especially excited to be the only firm in the marketing services space to be recognized. Many thanks to our client, Zipcar, for nominating us. The summit was held last Friday, 5/15/09, and we were presented with our award (even the plaque was made with recycled materials!). Please click here for a list of the other winners. Here’s a link to a PDF of the article. Many thanks for your interest!